We have 4 absolutely beautiful, good cuality, perfectly folded ears boys and girls for sale. Kittens are vet checked, Micro chipped, vaccinated, litter scratching trained upto date, wormed and flea treatment. Theys very friendly, lovely temperaments, have been very socialised and childrens, dogs and other pets. 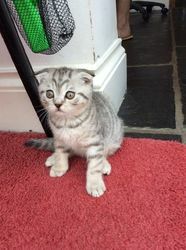 Is real scottish fold /straight eared breed, they not mixt with Brittish Shorthair separate breed.